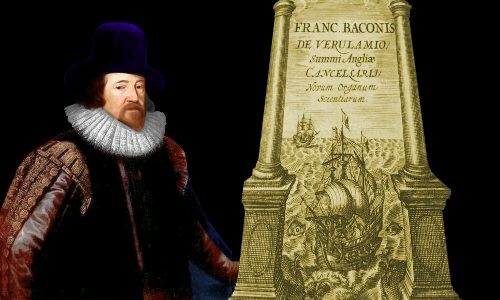 Francis Bacon discovered and popularized the scientific method, whereby the laws of science are discovered by gathering and analyzing data from experiments and observations, rather than by using logic-based arguments. Francis Bacon was born into a prominent wealthy family in London, England, on January 2, 1561. He was the family’s youngest son. Bacon’s father was Sir Nicholas Bacon, who held the powerful government position of Lord Keeper of the Great Seal. His mother was Anne Cooke, a scholar, translator, and holder of strong Puritan beliefs. She tried hard to ensure her children were as well-educated and as puritanical as she was. Anne Cooke’s father had been tutor to King Henry the Eighth’s son, who became King Edward the Sixth of England. Other notable people who lived in the same era as Bacon include Galileo Galilei and William Shakespeare, both born in 1564, and Johannes Kepler, born in 1571. Bacon’s education reflected his upper-class background. He was tutored at home until, aged 12, he entered the University of Cambridge, where he was again tutored privately. His lessons were conducted entirely in Latin, focusing on arithmetic, astronomy, geometry, grammar, music theory, logic, and rhetoric. Grammar, logic, and rhetoric were considered the most important subjects. Bacon earned a reputation as a serious boy who worked hard. At Cambridge and other European universities the sciences, then known as natural philosophy, were dominated by the ancient works of Aristotle. Bacon began to think that, although Aristotle’s intellect was formidable, his ideas and methods led nowhere. Bacon deplored the unquestioning way scholars treated Aristotle’s work, making the Ancient Greek philosopher a dictator in all but name – a dictator Bacon believed now stood in the way of scientific progress. Bacon produced a large body of scientific work. His science produced no world-changing results, but his guidelines for how science should be carried out did. It was obvious to Bacon that Europe in the early 1600s enjoyed significantly better technology than the classical world had. For example, the printing press had democratized knowledge; gunpowder had made armies much more powerful; and the magnetic compass had facilitated better navigation and the discovery of the Americas. He found it monumentally frustrating that people’s intellectual understanding of the world had not progressed beyond that of the Ancient Greeks’. The image below is taken from Instauratio magna, a multi-volume work in which Bacon explained how new knowledge in all human activities could be discovered. The image conveys an important symbolic message from Bacon to his readers. Part of the title page illustration of Instauratio magna. The two pillars are the mythical Pillars of Hercules, marking the end of the Mediterranean Sea and the beginning of the Atlantic Ocean. Bacon believed it was time to move beyond the ancient philosophies which had come from Mediterranean countries, and with fresh minds and new methods set out on an up-to-date exploration of the laws of Nature. The discoveries would be rewarding, both financially and intellectually, as the voyages to the New World had been. The attitude of most scholars in the early 1600s was, in short, that after you had mastered what Aristotle had to say about Nature, you knew everything. You could then go off and do something else. Bacon’s objective was to replace Aristotle and Plato’s works, which were based on logical and philosophical arguments, with a new body of scientific knowledge secured by experiments and observations. He also objected to the tendency of Aristotle, Plato, and others including Pythagoras to mix scientific ideas with religious ideas. Bacon believed that the two should be kept separate. He was highly suspicious of people who said the laws of nature were there as part of a greater purpose. He thought they were there to be discovered and, if possible, exploited. Bacon’s most significant work, Novum Organum (The New Tool), described what came to be called the Baconian Method of science. Published in 1620, it was part of his Instauratio magna series of books. Bacon championed the inductive method in science. This means you move from specific facts to a general rule. You do not start with a hypothesis or theory. Aristotle, on the other hand, used the deductive method. He would move from a general rule to specific facts. He started with rules he had developed from logical arguments. For example, imagine you lived in the 1800s and were interested in the electric conductivity of solids. An inductive investigation could have involved measuring the electric conductivities of a number of solid materials such as silver, gold, iron, platinum, lead, copper, zinc, tin, brass, sulfur, phosphorus, wood, table salt, granite, sand and sugar. The specific results would allow you to state the general rule that metals conduct electricity better than nonmetals. In a deductive investigation Aristotle, had he still been around, would have started with his general rule saying something like: “I believe that because [insert logical argument here], metals will be better electrical conductors than nonmetals.” He would then have used his rule to say that, for example, copper will be a better conductor than wood. Of course, if Aristotle’s rule turned out to be wrong, as it often did, then anyone who used his ideas would end up with a defective understanding of Nature, as indeed they often did. Hard work and vigorous interrogation are required. You need to devise experiments that ask Nature the right questions. Only then might she reveal the truth to you. She would not reveal the truth to philosophers such as Aristotle, who thought they could sit in a chair or lie on a beach and coax her into revealing her secrets simply by thinking. You needed to gather solid data first to guide your thinking. The man who epitomized the success of Bacon’s inductive method was born nine months after Bacon died. His name was Robert Boyle. Boyle was a Baconian. He believed that amassing data by experiment would allow him to discover new laws of Nature. And he was right. Using the inductive method he tore away the alchemists’ bonds of mysticism, unleashing chemistry as a genuine quantitative science. With the advantage of greater hands-on laboratory experience that Bacon, Boyle was able to enhance Bacon’s method. Boyle was the first person to write specific experimental guidance for other scientists, emphasizing the importance of achieving reliable, repeatable results. In 1660 Boyle helped found the Royal Society, the oldest scientific society in existence. History of the Royal Society. 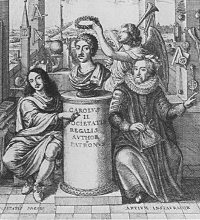 The frontispiece features William Brouncker, the founding President of the Royal Society and Francis Bacon seated alongside a bust of Charles II, the founding King. The Society was dedicated to learning Nature’s secrets by experiment. Its motto was Nullus In Verba – Take Nobody’s Word For It! The motto owes much to Boyle and Bacon’s preference for rational experiments over superstitions and the theoretical speculations of philosophers. The esteem Bacon was held in by the society is shown by his appearance on the frontispiece (see image) of the 1702 edition of History of the Royal Society by Thomas Sprat, published 76 years after Bacon’s death. Of course, while Bacon was writing in England about the importance of data and observations, Galileo in Italy had actually gathered data and observations, producing new ideas that were to replace Aristotle’s physics and astronomy. Galileo’s work was also an inspiration to Boyle. In England itself, William Gilbert had already practiced what Bacon preached, discovering by experiment in 1600 that our planet acts like a giant magnet. Likewise Johannes Kepler in Bohemia had discovered the laws of planetary motion using the superb planet data gathered by Tycho Brahe. Kepler’s laws revealed, among other things, that the earth and other planets move in elliptical orbits around the sun. Bacon, Galileo, Gilbert, and Kepler probably did more than anyone else to fatally undermine Aristole’s natural philosophy and begin a new age of rational science. In Novum Organum Bacon considered the instantia crucis – the crucial example. In a situation where there are competing theories, this would be the example that proves which theory is true. Obviously, a crucial example is highly desirable in science. In the 1660s Bacon’s idea was developed into the experimentum crucis – the crucial experiment – by Robert Boyle and/or Robert Hooke. In 1672 Isaac Newton performed the most famous crucial experiment of all, when he used a glass prism to split sunlight into a rainbow of colors and then recombined these colors into white light using a second prism. This proved that sunlight consists of light of different colors which have different refractive indexes. Newton’s crucial experiment with two prisms. The result absolutely demolished competing theories, such as the proposal that glass added the colors to sunlight. Bacon’s ideas are still used today – the vital importance to science of experimental data and observations are now beyond doubt. 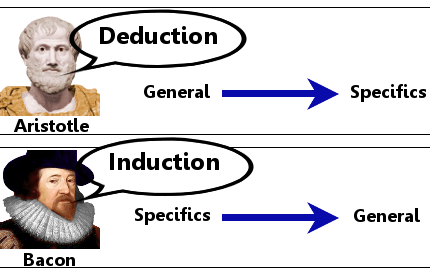 Nowadays many scientists use the Hypothetico Deductive Method. The basis of this method is that a scientist states a hypothesis and then uses data to establish whether the hypothesis is true or false. When using this method it is important that the hypothesis is written in such a way that clear criteria are stated to establish its falseness. Bacon’s attempts to organize and systematize the way science is done were only a small part of his life’s work. He actually devoted most of his time to his legal career, in which he rose to be one of the most powerful men in England, before he was brought swiftly to earth by a bribery and corruption scandal. At the age of 15, Bacon followed in his father’s footsteps and began studying to become a lawyer. He moved to London for training at Gray’s Inn. Before his sixteenth birthday he began a three-year tour of Europe taking in France, Italy and Spain. A grand tour like this was seen in wealthy society as the perfect way to complete a young person’s formal education. In Bacon’s case, his father placed him with the English Ambassador to France for two years, so he could learn politics and diplomacy. Despite his young age, Bacon performed diplomatic duties on behalf of Queen Elizabeth’s government in France. Shortly after his eighteenth birthday, news reached Bacon that his father had died. He returned to England and subsequently began working very seriously as a lawyer. His legal and political careers would eventually carry him to the highest position in England’s legal profession. Aged 42 he was knighted for his service to King James, becoming Sir Francis Bacon. His career really took off in 1603 when he was 42 years old. In that year Queen Elizabeth died and was replaced by King James. Bacon was a very loyal servant to King James. As he grew older, Bacon’s considerable skill as a writer also began to emerge. Starting in his thirties he authored a prodigious number of highly regarded essays on a wide variety of topics including friendship, wisdom, health, beauty, anger, parents & children, atheism, the union of England & Scotland, and innovation. He seems to have needed little sleep. He would go to bed late and rise early, giving him an unusually long working day. The quality and quantity of his work is so high that a number of people have proposed that William Shakespeare’s plays were actually written by Bacon, who needed to remain anonymous because of his political ambitions. Bacon reached the top when, at the start of 1618, he became Lord High-Chancellor of England. His term at the top of the greasy pole was short. His political downfall came in 1621, when he was 60, and was perhaps inevitable. Although he was a highly intelligent man and seems genuinely to have wanted to act in the best interests of his country, he also had an insatiable craving for money. In terms of Bacon’s own words quoted above, the modern perception of him is that instead of spreading the manure fruitfully, he conspired to build his own colossal pile of it. But this is untrue. Bacon really did spread the money, in most years spending more than he earned. The fact that he married a woman many years his junior, and she had expensive tastes, might go some way to explaining this. Bacon was eventually investigated for bribe taking and corruption. He admitted his guilt to this. In his defense he said that, although he had taken bribes, he had still applied the law correctly, even if this disadvantaged the people who had bribed him. In fairness to Bacon, the giving of gifts in expectation of a favorable outcome was very common in the legal environment he worked in. He was not acting especially unusually, although had his Puritan mother still been alive, she would have been mortified by his behavior. His punishment was minimal, particularly given the brutal punishments often inflicted for wrongdoing in those days. In the end he spent a few days in prison and was fined a large sum of money, but the fine was canceled. He was banned from holding any more positions in government, and he lost most of his government pension. Bacon married rather late in life, on May 10, 1606, at the age of 45. His bride was Alice Barnham. The marriage took place four days before her fourteenth birthday. Alice Barnham came from a wealthy family. Alice Barnham appears to have been a rapacious woman, and for a time, her appetite for the trappings of wealth was amply satisfied. When Bacon was disgraced in 1621 she stuck with him at first, but in 1625 they broke up. The marriage had produced no children. Bacon died in the year following their separation. He died because he spent too long working in low temperatures. This was the time of the “Little Ice Age” when winters in Europe were colder and longer than today. At the beginning of April 1626 snow still lay on the ground, and Bacon became inspired to carry out some experiments on food preservation by freezing a chicken. Unfortunately he became chilled by the cold conditions. He got a bad cough and his health then deteriorated rapidly. Francis Bacon died aged 65 on April 9, 1626 of pneumonia in Highgate, near London. He was buried at St Michael’s Church in the town of St Albans, where he owned a mansion on a 2,000 acre estate he inherited from his father. "Francis Bacon." Famous Scientists. famousscientists.org. 1 Dec. 2015. Web.